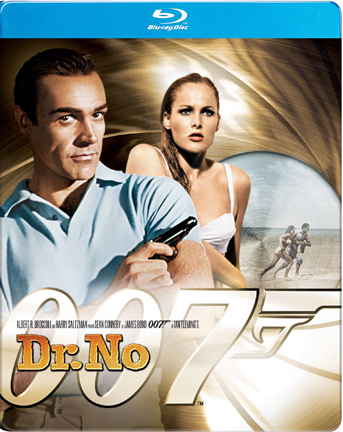 Today October 5th 2012 is the 50th anniversary of the release of Dr. No. Today is Global James Bond day and some of the festivities include the release of Adele’s single Skyfall which is the theme song to the new Daniel Craig James Bond film of the same name. The James Bond film franchise is simply my favourite film series of all time. I love the films and I love all the actors who portrayed the super spy. I remember watching the films when I was super young. It used to be exclusively on TV on ABC. It seemed like Sunday nights is when they would often air. My Dad loved the films. I would watch them with him. Great memories. When I started to watch these films, the franchise was probably about 15 years old. Now, we are celebrating 50 years. Every time a new Bond film comes out, I try to devote the weeks coming up to the new film release to watch previous Bond films. I don’t do all of them, I try to do a selection of films. I try to do 1 film from each Bond. This year is a little special as this the 50th anniversary of the Bond films. The film franchise started in 1962 with Dr. No and this year we get the release of the 23rd Bond film Skyfall. Getting ready for the release of Skyfall, I decided to watch the first film from each actor who played Bond in the official film series. This is pretty exciting for me as I haven’t watched any Bond films in a while so I was looking forward to this. Obviously, it made sense to start with the first Bond film: Dr. No. James Bond, obviously, started as a book series and was created by Ian Fleming. The first novel was Casino Royale in 1952 and almost immediately garnered interest to being more than just a literary character. Bond made his first appearance in the 1954 adaptation of the Climax program, Casino Royale. Bond was portrayed by Barry Nelson. It’s not exactly a very action packed production but then again, the original novels were not exactly what we would come to expect in the films. The live television production is an interesting time-piece but I know when I watch this, I keep thinking I would rather watch a Bond film. Although Producer Harry Saltzman ultimately ended up with the film rights to make James Bond films, it was Producer Albert R. Broccoli who really wanted these rights from Saltzman since he was running out of time to do something with them. Saltzman didn’t want to sell the right but he did want to partner with Broccoli. Clearly, he was smart enough to see that Broccoli meant business. They originally wanted to make Thunderball as the first Bond film but there were legal issues going on at that time between creator Ian Fleming and writer Kevin McClory. That is a whole other story and a great book that covers that whole situation is Battle for Bond by Robin Sellers. It is a great background about the whole sad situation. 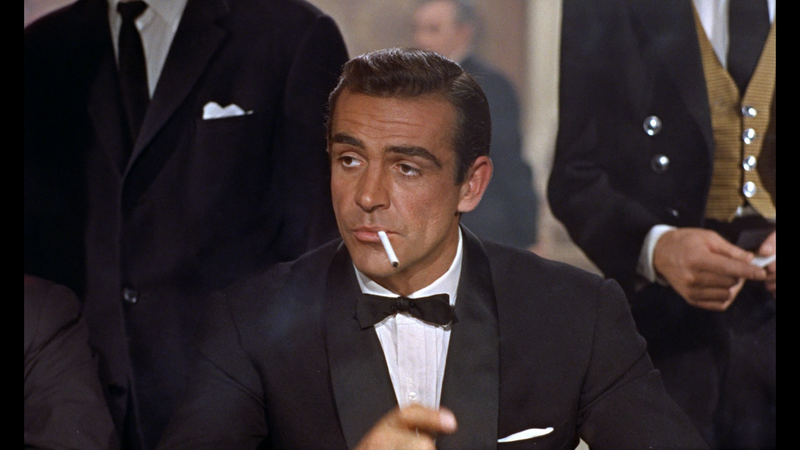 Dr. No was eventually chosen to be the first story adapted to the film series. This is an iconic film. It amazes me by how much of the formula of what makes this series so popular shows up in this film. It’s like that got it right first time. Though what I also find interesting about this film is that I think this is a tale of two almost films…. 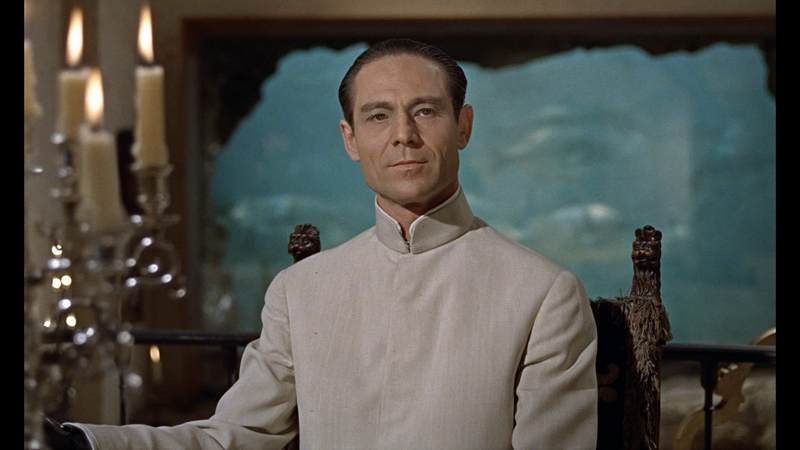 Apart from the amazing opening credits and music, Dr. No starts out as any other film from the genre. Apart from Sean Connery who is instantly magical as James Bond, the film looks like anything done in the early 1960s perhaps even late 1950s. Jamaica is a very exotic location but everything else seems very small in scale. There are some car chases and genuinely hairy moments for James Bond. The James Bond era begins, in my opinion, when Professor Dent secretly travels to the lair of Dr. No. 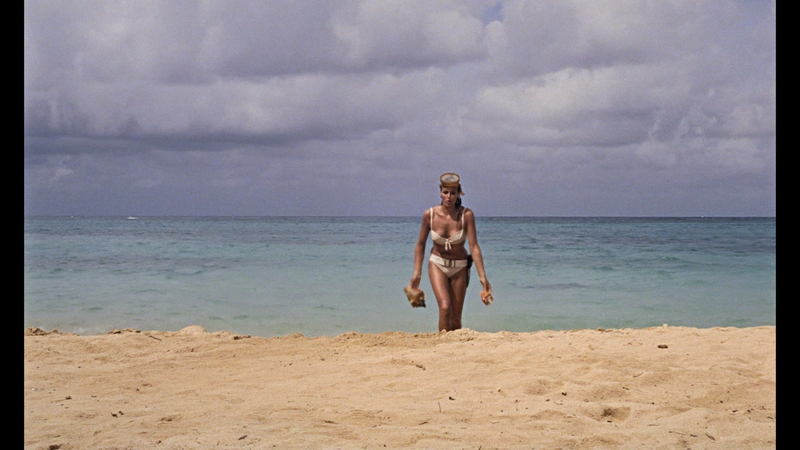 We never see Dr. No in this scene but we hear him and Dent is put in one of the most spacious and over-the-top rooms. It is gorgeous. The whole film opens up at that point. 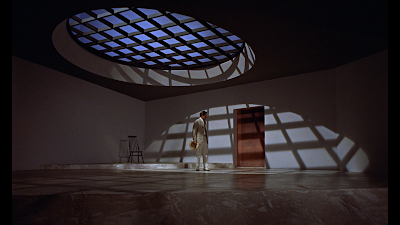 That is due to Ken Adam who was the production designer on it. That room was a glimpse into what we were going to see for not only the rest of the film but sets a precedent for the rest of the film franchise. The movie from the start is strong and I have a feeling it blew the audience away in 1962. The theme music by Monty Norman is one of the greatest pieces of music ever created. It is the most recognizable and still sends chills down the spines of many people. The title sequence sets the stage for everything that comes after. Not only the colourful dots and silhouetted people in the sequence credited by Maurice Binder (who does all but 2 of the title sequences up to License to Kill), he also creates the most iconic look in film just because he was interested in seeing what it looks like. The now very famous sequence, the gun barrel sequence, was created by Maurice Binder by putting a pinhole camera inside a .38 caliber gun. This created a sequence that has been used, in some way, in every Bond film since. The two Daniel Craig films have used these sequences in new ways but it’s still there. That being said, I prefer to have them at the start of the film. If anyone cares, the version that was shot for Dr. No appears in From Russia with Love and Goldfinger. Interestingly, this version actually isn’t Sean Connery in the gun barrel but stunt man Bob Simmons. Much of who James Bond is in this film really isn’t because of Ian Fleming’s characterization but more down to Director Terence Young who had a clear idea of what kind of character he wanted this to be. Very quickly James Bond had a dry wit. He would make dark-morbid quips about someone but were also funny. It caught on quickly with audiences. You are not going to find that in the novelizations. Much of the cast and crew have said in the documentary, Inside Dr. No, that Terence Young was James Bond and he brought a lot of himself to the film and coached Connery on different things he could do to with the role. It was clear that Young and Connery were on the same page. One thing that was completely Fleming was Bond’s love of the good life and women. It is clear from the start that Bond is refined and is cultured. He is not just a thug who kills for the British government but someone who likes to live well and benefits from the places he goes. We first meet him at a table at the club Le Cercle at Les Ambassadeurs playing the card game Chemin de Fer. We only see his hands and we don’t see his face until Sylvia Trench asks him his name in which he answers for the first of many times, “Bond, James Bond.” Even that is there right from the start. Bond does not appear in Dr. No until 8 minutes into the film. 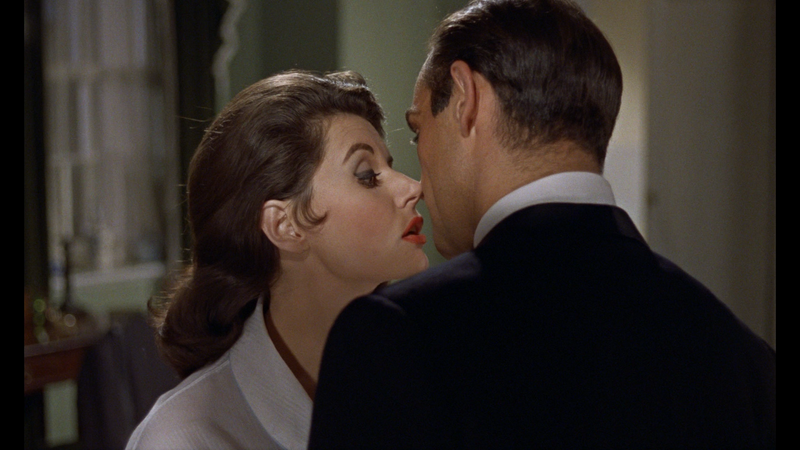 It is 14:55 until Bond hooks up with his first lady, Sylvia Trench. She is waiting for him when he gets back to his house. Prior to that, Bond was at the office meeting with his superior M played by the great Bernard Lee. At this point, Bond gets his new gun and he is about to go off to Jamaica to figure out what happened to Strangways. Strangways runs a communications station in Jamaica and is shot outside of his car on his way to make his routine check-in. Back at the actual communication center, his secretary is also murdered. Bond eventually meets CIA operative Felix Leiter. He is out there to assist Bond and for the first time we meet Leiter he is played by Jack Lord. Jack Lord would eventually garner further fame by starring in Hawaii 5-O. We also meet Quarrel who was working with Leiter. Quarrel and Bond end up going to Crab Key because it is clear that rocks coming from Crab Key are radioactive. There is also the base that Dr. No operates from is at Crab Key. Bond and Quarrel secretly sail out there at night to avoid being found. The next day, they find something else, Ursula Andress. Ursula Andress as Honey Ryder coming out of the sea at Crab Key is considered to be one of the greatest sequences in film history. There is something sophisticated and contemporary about Ursula that the other Bond women in this film don’t quite achieve. It doesn’t take long for Dr. No’s men find the intruders on Crab Key and send their “dragon” out to get them. It has a sequence that I find to be the most frightening death from the entire film series. Quarrel is burned alive by the “dragon” which in reality is a tank made to look like a dragon and has a flame thrower. For 1962, it’s pretty graphic. Also, the fact that Quarrel didn’t want to go to Crab Key and was frightened of the dragon makes it all the more unfortunate. At dinner, Bond and Honey are dressed very modernly. Up to this point Bond has been wearing a regular suit (from Seville Road) but now he is wearing a collarless shirt and looks distinctly different almost of Chinese origin. 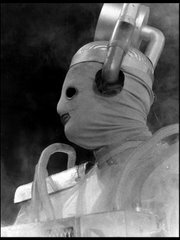 We finally meet Dr. No who is tall and has metal hands that have super strength. Dr. No is fully seen in the film 1 hour and 27 minutes into the film He is also a calmly soft-spoken person and this creates the first of many Bond super villains. 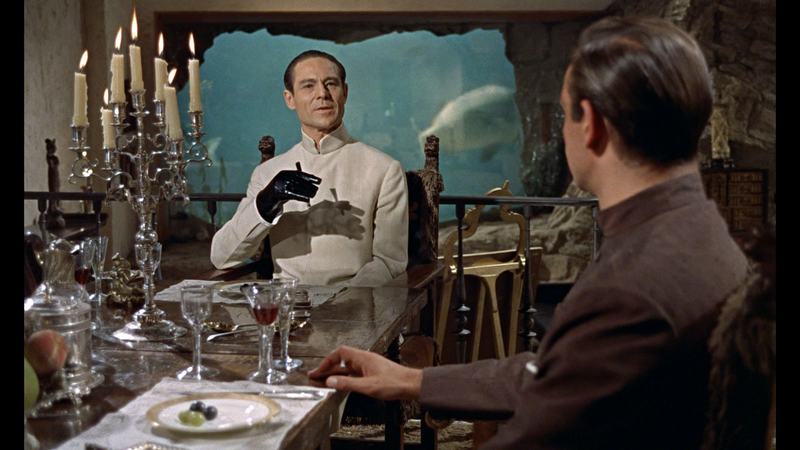 Once again, we see this menacing politeness in which Dr. No is threatening Bond but never raises his voice. As Honey is taken away by Dr. No’s henchmen, Bond responds with threatening to break a bottle of wine but Dr. No reminds him what vintage the bottle is and Bond reconsiders and puts it down. Dr. No also informs Bond about SPECTRE (SPecial Executive for Counter-intelligence, Terrorism, Revenge and Extortion). This is something else that will stay with the franchise for some time. The film ends the way that many of the Bond films end. A battle in a massive (and I mean massive) control room with Dr. No drowning in super radioactive water. Regardless of how iconic this film is, I am actually not a huge fan of it. In fact, I watched this from the first issue Blu Ray disc released a few years ago and when I went to get the disc to put into the player, I realised I’ve never opened it until now. I think the reason why this is not one of my favourites is simply because I started to watch these films when Roger Moore was Bond. The film franchise was quite different by that point and the more scaled down film that is Dr. No might have been a little too scaled down for me. 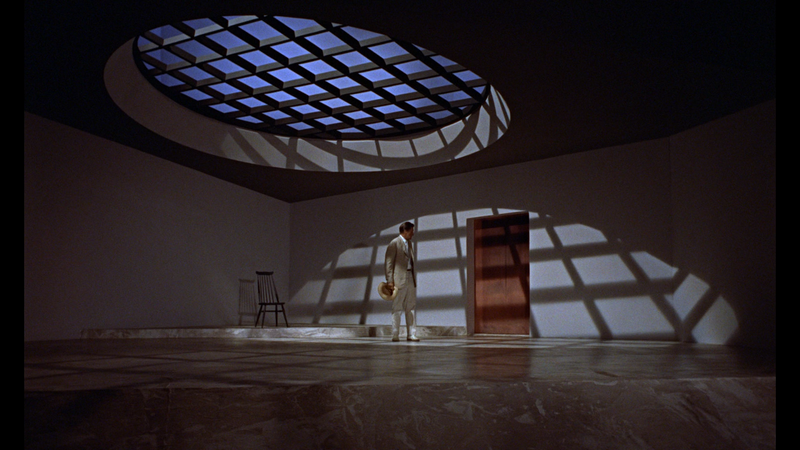 As I mentioned above, once Professor Dent goes to Dr. No’s secret hideout and is in the room with the incredible skylight, the film changes momentum for me quite quickly. Some things I notices about this film that I thought was interesting was that when Bond fights the young man who is supposed to pick him up at the airport, after Bond punches him a lot, Bond’s knuckles are slightly bloodied. I had never noticed that before. One thing I like about this film and is always present in most of the films from the 1960s to 1970s is that there is truly an international feel to these films. It’s just how the films are shot that always gives me this feeling and what I like about it is that sometimes I don’t even think they are trying to do that, they just are trying to have the film in an exotic location. I guess what I mean by that is when Bond is being held in the Jamaican bar where he meets Leiter for the first time; there are boxes and boxes of Red Stripe beer. Of course that makes sense because that is a Jamaican beer but seeing it there really adds to the authenticity of the scene. I also find amusing that the phrase of Bond’s martini’s shaken not stirred is there from the beginning and is mentioned twice but neither time by James Bond himself. The Blu Ray is superb. That doesn’t adequately explain how great this film looks. If you have not seen this on Blu Ray, imagine how perfect you would like to see this film look and times it by two. This film is that good. If you are a Bond fan but do not have this on Blu Ray, please go out and purchase this now. If need be, get a Blu Ray player too. Lowry digital did the restoration for this and all of the other Bond films. The colours are crisp. The detail is sharp. Immediately from the opening credits my eyes popped out of my head because the look and colour of these films are so profound and wonderful. It is fantastic! Even not being a huge fan of this film, it is worth it for how it looks. On a side note, if you have access to the original laserdisc release of Dr. No, the commentary made that version of Dr. No banned and the same thing happened with the original Laserdisc versions of From Russia with Love and Goldfinger. 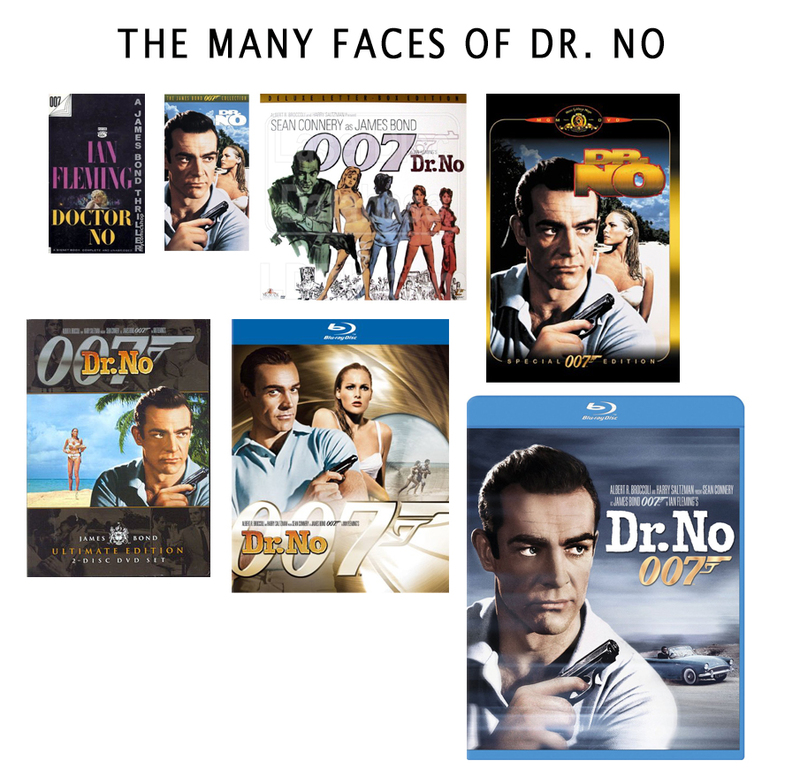 I have a DVD transfer of these and while I don’t think the remarks on the Dr. No disc are too terrible, it was enough to piss off Albert Broccoli. Next week: I continue on this journey with Bond as I look at the only George Lazenby film On Her Majesty’s Secret Service. Why do I think this is possibly the best Bond film made despite the efforts of the Producers of the film? Also, why does this film have me so pissed off at Best Buy? Find out when I publish the article! Have a fun Global James Bond Day!